More About Fatima and the Immaculate Heart of Mary REV. FR. V. MONTES DE OCA, C.S.Sp. Lucy relates that on June 13th, 1917, after speaking at length about her Immaculate Heart, Our Lady of Fatima again stretched forth her hands, throwing on the children the rays of that immense light in which they saw themselves as if immersed in God . . . The Blessed Virgin held in her right hand a Heart surrounded by thorns, which pierced it from all sides. The seers understood that it was the Immaculate Heart of Mary, afflicted by all the sins of the world, which demanded penance and reparation. 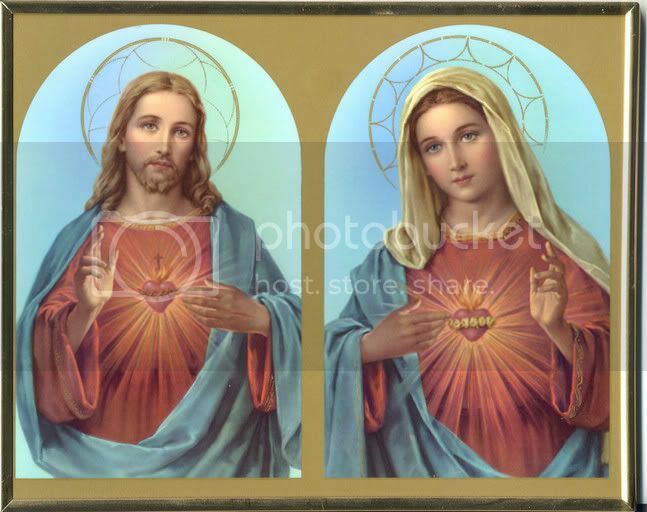 "It seems to me," said Lucy, "that on that day, the purpose of the light was to pour into us a special knowledge and love of the Immaculate Heart of Mary, as on other occasions it infused into us the knowledge and love of God, and the mystery of the Blessed Trinity. From that day, indeed, we experienced a more ardent love for the Immaculate Heart of Mary." Francis had observed that this supernatural light, that the Blessed Virgin threw on them and on the world, seemed to come from her Heart. He afterwards asked Lucy: "Why did the Blessed Virgin hold a Heart in her hand throwing on the earth this great light which is God? You were with the Blessed Virgin in the light that went down to the earth, while Jacinta and I were in that which went up to heaven!" "It is because you and Jacinta will soon go to heaven", said Lucy, "while I shall remain some time longer on earth with the Immaculate Heart of Mary." "Is it the Blessed Virgin who explained to you the meaning of the two beams of light?" "No, I saw it in the light that she put into our breasts." "That is right," interposed Jacinta, who followed the conversation, "I saw it also." Jacinta seems to have received "a special light to understand intimately and in detail the meanings of these heavenly revelations." Before leaving for the hospital in 1919, she said to Lucy: "I am going soon to heaven. You will remain still on earth to make known to men that the Lord wishes to spread in the world devotion to the Immaculate Heart of Mary. When you have to speak about it, you will no longer have to hide yourself! Proclaim openly to the whole world that: "It is through the Immaculate Heart of Mary that God wishes to grant us His graces!" "It is from this Immaculate Heart that we must ask for them!" 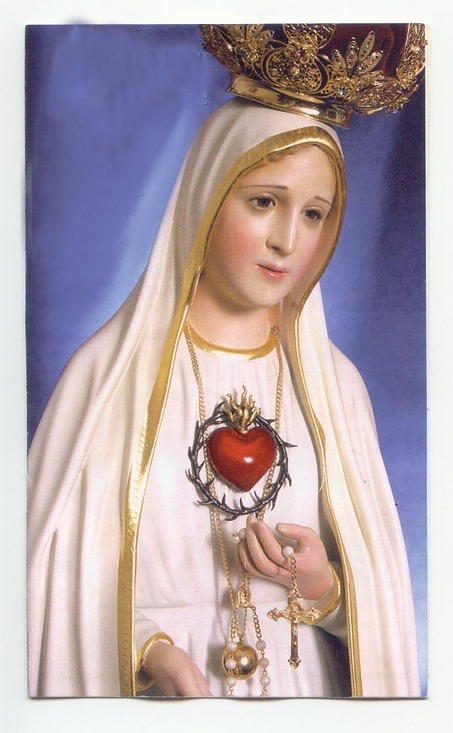 "The Heart of Jesus wishes the Immaculate Heart of Mary to be venerated with His own!" "It is through the Immaculate Heart of Mary that peace must be asked, because it is to that Heart that the Lord has confided it." "How I love the Immaculate Heart of Mary! It is the Heart of Our Heavenly Mother!" "Oh! if only I could put into all hearts the fire I feel in my own, which makes me love the Hearts of Jesus and Mary so much!" Besides, the best commentary on the devotion to the Immaculate Heart of Mary is that left us by the children in the admirable example of their lives. After the revelations, indeed they were true models of devotion and reparation to the Immaculate Heart of Mary. They loved this Immaculate Heart ardently, they invoked it constantly, they spoke about it enthusiastically, and they multiplied sacrifices to console it and to make reparation for all the blasphemies and offences that cause it to suffer.Practices of Devotion to the Immaculate Heart We have already spoken of penance and the daily Rosary so much recommended by Our Lady of Fatima. We give now the three principal practices of devotion for which she has asked in honour of her Immaculate Heart; the First Saturday of the month, the Five First Saturdays and the Consecration. They bear a marked similarity to the practices now so widespread in honour of the Sacred Heart of Jesus. 1. The practice of the First Saturdays consists of the following exercises, performed with the intention of consoling the Immaculate Heart of Mary, and making reparation to it for all the outrages and blasphemies of which it is the object on the part of ungrateful Christians: 1, the Rosary; 2, Communion of Reparation. 2. For the practice of the Five First Saturdays. In addition to the two exercises already mentioned, the following two are added on the first Saturday of five consecutive months: 3, go to confession; 4. keep the company of the Immaculate Heart of Mary by meditating for a quarter of an hour on the mysteries of the Rosary. These two must be offered in reparation to the Immaculate Heart. .The meditation may be on one or several mysteries. 3. Consecration to the Immaculate Heart of Mary. As is known, Our Lady asked that Russia be consecrated to her Immaculate Heart and Lucia, the surviving seer has explained that She wants the Pope and all the bishops of the world to do this on one special day. If this is done She will convert Russia and there will be peace. . .